Goldsmith has since then produced a number of works that explore the iterations of the book through conceptual writing. For example, in retyping the New York Times and publishing the result in book form, Goldsmith transforms the disposable newspaper into a monumental brick-sized book on a par with the largest of the modernist long-poem masterworks, such as Pound’s Cantos or Olson’s Maximus Poems. Just as Prigov stresses the monastic act of copying and retyping in his work, so an important part of Goldsmith’s presentation of Day is his stress on the laborious task of retyping and OCR-scanning the New York Times. In both cases, the task of retyping stands in absurd contrast to the ease of copying in the digital age — the act of copying and the book as a copy thus mark the book’s reiterated presence in the age of digital reproduction. 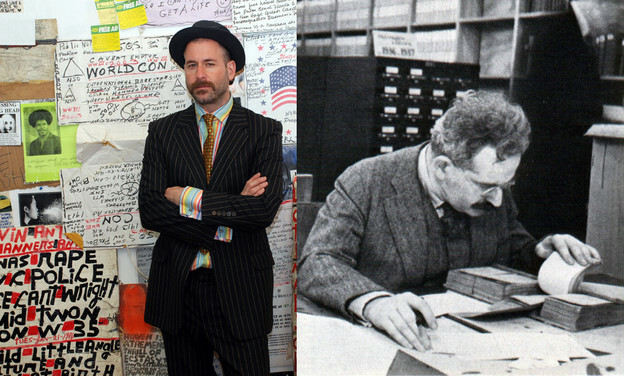 Goldsmith also engages with the book as copy and particular embodied instantiation in a work that is purely digital: his “Kenneth Goldsmith Sings Walter Benjamin,” the first in his serial audio work Kenneth Goldsmith Sings Theory, which comprises interpretations for music and voice of texts from such well known theorists as Theodor Adorno, Roland Barthes, and Harry Potter. For his Benjamin text, Goldsmith chooses to sing almost the entirety of “Unpacking My Library,” a text that, as I’ve noted in a previous post, evinces both an interest in the singular quality of the individual copy and a focus on the book as a product of mechanical reproduction. Just as Benjamin lists copies of other books and the associations they bring, so Goldsmith copies Benjamin, creating an idiosyncratic audio book version. In his performance of the text, Goldsmith fuses precisely delineated musical sections, or movements, with the chaotic, shifting pitch and tone of his voice, paralleling Benjamin’s observation in the essay that “if there is a counterpart to the confusion of a library, it is the order of its catalogue.” Recalling Benjamin’s vision of the collector’s magic and tactile relation to his or her objects, Goldsmith’s performance embodies the mark that the reader or collector leaves on a text through his idiosyncratic (to say the least) vocal rendition. The extreme idiosyncrasy of Goldsmith’s version matches the idiosyncratic and, in Benjamin’s words, “whimsical” account given in “Unpacking My Library.” In both cases, the individual copy is marked by its collector, in Benjamin’s case by each book’s relation to his personal history, in Goldsmith’s by his voice and intonation.